Center Parcs at Woburn was transformed into a magical Winter Wonderland at the weekend for the first time since it opened last year. 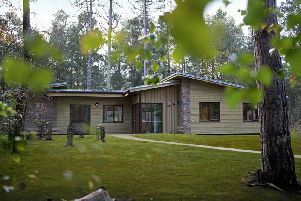 The popular holiday village Woburn Forest has been given an extreme makeover with the full festive treatment for the very first time and it was unveiled on Friday. The Winter Wonderland experience has been a firm fixture at the holiday firm’s other four UK villages for a number of years with more than 190,000 guests attending each Christmas. Aside from the usual raft of things to do at Center Parcs, the Winter Wonderland experience means there are also a host of seasonal activities to get families into the Christmas spirit. While London is usually the nearest destination to be fully immersed in the run up to December 25th with the famous Winter Wonderland there, Woburn now offers the chance to ‘experience the festive period like never before’ with visits to Santa in his woodland workshop and even the chance to see real reindeer. Kids can decorate their own stockings, join the Parc’s ‘Elf Academy’, take a festive carriage ride or even decorate their own Christmas pottery. There is also a twice-weekly pyrotechnic and special effects show which lights up the night sky. Being on the doorstep of the home counties Woburn’s Winter Wonderland offers a genuinely top class all-round experience that probably only Disneyland can match. It isn’t a case of a few lights here and there and some decorations dotted around. Some serious man hours go in to the magical transformation. According to Center Parcs it usually takes 290 days to plan and create the Winter Wonderland and involves a team of 200 people. A huge total of 3.36 tonnes of paper-based, biodegradable snow are used to decorate the five villages while a staggering 70,000 fairy lights are put on display on the trees and decorations around each village. The Winter Wonderland theme is not a cheap gimmick and Wayne Matton, the Parc’s general manager hopes it will quite literally make people see the firm in a different light. He said: “We have had an amazing first year of breaks and we’re thrilled to be able to bring Winter Wonderland to Woburn Forest for the first time this year. “Some people out there who think that we are just about the summer but, for us, the winter is just as special. Being tucked away in the woods with loved ones surrounded by a plethora of Christmas events and having deers, squirrels and rabbits as your neighbours is a once in a lifetime experience. Certainly holidaying at home during the festive season has never been closer or of a higher standard given that the firm retained its Hospitality Assured status following a rigorous assessment last month. It also plans to add to its ever-growing empire with news that planning permission has just gone in for another village to be built over in Ireland. Find out more about Winter Wonderland.